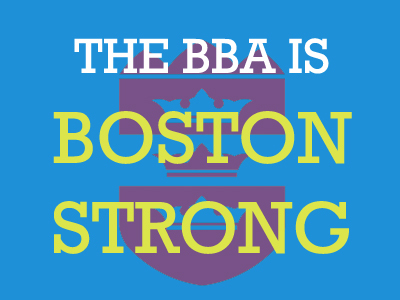 The BBA is offering pro bono legal assistance to individuals and small businesses affected by the Boston Marathon bombings. Thanks to the commitment of our members, the BBA has offered legal assistance to 26 small business owners and individuals who were affected by the Boston Marathon attacks. Through a collaboration with the Mayor’s Office and the Massachusetts Office of Victim Assistance, the BBA is continuing to get the word out about the available legal services and adapting to the needs of the victims and small businesses in order to effectively refer callers. Do you know a small business owner or a victim in need of assistance? The Boston Bar Association is connecting those affected by the Boston Marathon bombing to lawyers that can provide pro bono legal assistance for issues such as insurance, labor and employment, relocation, health, and other issues. To access these services, please call the Lawyer Referral Service intake line at 617-742-0625, or Toll Free: (800) 552-7046, or submit an online request here. Stay tuned for more information as the situation continues to develop. For more information on the Marathon Monday Project, please contact Katie D’Angelo, Public Service Programs Coordinator, at [email protected].